I'm a bit late with my Tuesday post. oops, it does happen. I do have a good reason. I wanted to finish this afghan so I could show it to you. I think it was worth waiting for. I am happy with the results and look forward to passing it to my son along with the green one. He's been looking forward to presenting them to his friends before their babies are born. If you would like to view the green afghan and see how to wrap a baby in a star blanket, visit my earlier post. Thanks for visiting with me today. 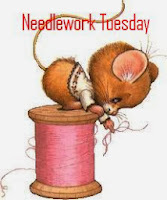 Mister Linky is waiting below for a link to your current needlework post.